The portable darkroom is not finished yet but I wanted to try and make some plates outside anyway. So, not too far away from home, a street further somewhat, I set up the camera leaving my boyfriend to keep an eye on it while I poured the plate in the darkroom at home etc etc. Figuring out exposure time..hmm..more tricky than I anticipated. I thought winter, less UV, let’s start out with 25 seconds, remembering that the first plate I made of my little brother outside got 15 seconds and was way underexposed. So, after the exposure ran back home, poured the developer, within 3 seconds I got an image and woefff, gone it was again. Shoit, that must be way overexposed. So, again. 15 seconds next exposure time. Got back home, poured developer, 7 seconds got an image and gone it was again…arrgg. Overexposed again. So, again, 8 seconds exposure time. Got back home, poured developer, 9 seconds got an image and gone it was again….aaarrrggghhhh, (this would have been the third session in a row filled with failure, I mean, learning issues of course and I felt a bit down). Okay, another one. While pouring the Collodion I realized I forgot to take of the cap of the drain bottle, made a strange movement and flipped over the bottle with Collodion which was opened…arrgghghhh! So, my mood was going down drastically. Anyway, tried that plate right outside our house, made a portrait of Bart to see if my next time would be more close to perfect. 4 seconds completely stopped down the lens to f14. Great! That worked! A little on the bright side but that got my hopes up again. 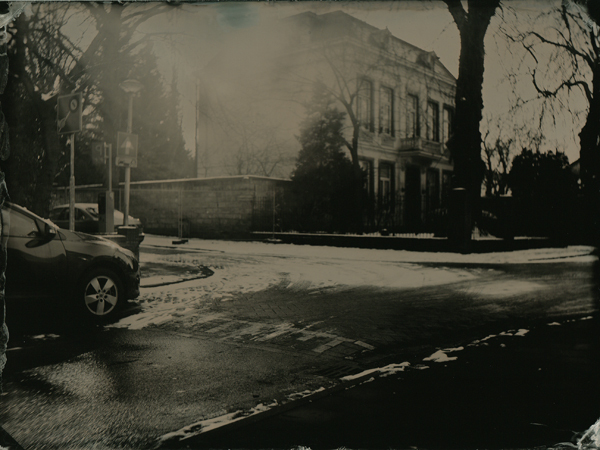 So, set up the system again at that special corner of the street, exposed the plate for 2 seconds f14, ran home to develop and…Voilà! A wonderful plate came up to the surface! Not to give up easily, not to loose my temper too early (that’ll take a lifetime for me to figure out how to do that exactly 😉 ), keep in mind the bellows extension of which there was hardly any due to the subject being much further away than in my studio and being outside in the snow with lots of sun and a bit of clouds which reflects the UV pretty good = shorter times. My Collodion is probably pretty sensitive as well as I really did not expect it to be this fast. One more cool thing: Old lenses are not coated, I had the sun shining in my lens a bit and you can see that in the upper house part, the flare. P.s. The sidewalk in the lower right corner contains much more detail when looking at the plate. Scanning and keeping that detail was pretty much impossible. This entry was posted on February 1, 2010 by Contrastique. It was filed under Wet Plate Collodion-Photos and was tagged with maastricht, wet plate collodion.